At Isla Mujeres in Mexico for a few days of R&R after a hectic school term, soaking in some sun before heading home to Ohio for Christmas. I’m trying to get caught up on sleep, do a little scuba and read some books. 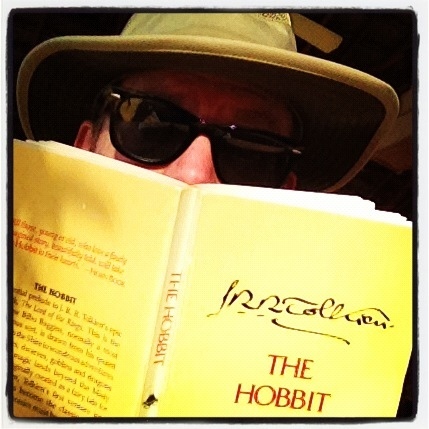 The first was a re-read of The Hobbit. I brought along my 1979 copy of the Tolkien classic – to bone up on all things Baggins, dwarf and Smaug before seeing the first of the three films this slimmest volume of the series has spawned. Yesterday, Efrain, a waiter at the beachside Na Balam hotel restaurant noticed the book and said how much he loved the Lord of the Rings movies and was looking forward to seeing the new one. But he loves books even more. “Nothing is better than the imagination,” he said.